Situated in one of southern Vancouver Island’s Western Communities, Akemi Sushi is located in Langford’s Station Square on Goldstream Avenue. The restaurant offers a wide variety of dishes incorporating western and traditional Japanese cuisine. The owner, Frank, has been accommodating his customers’ food wishes since Akemi’s creation back in 2006. A move from the original Ledsham Road location in the nearby Greater Victoria municipality of Colwood has helped supply a steadily growing demand for Japanese dining on the Westshore. Prices are on the higher end of the spectrum, as our bill totaled almost seventy dollars for the following items of take-out sushi. Pictured above from left to right is the Dancing Fire Roll ($14.95) – Real crab meat, avocado, cucumber, and topped with smoked salmon, cream cheese and roe. Next is the Akemi Roll ($11.99) – Real crab meat, cream cheese and cucumber topped with smoked salmon and sliced avocado. And finally the Rainbow Roll ($11.99) – Real crab meat, roe and cucumber topped with salmon, tuna, snapper and surf clams. 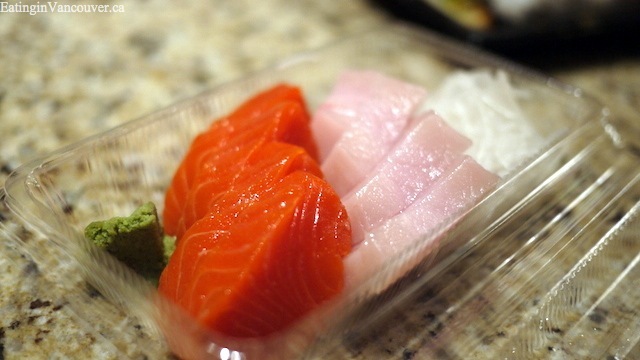 Above are eight pieces of salmon and tuna sashimi for $11.95. Below is the Victoria Roll ($5.09) – Avocado and cucumber topped with sesame seeds. 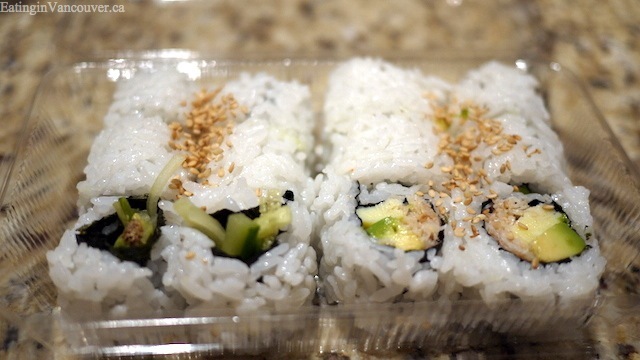 And Akemi’s California Roll ($5.59) – Real crab meat, avocado and egg topped with sesame seeds. 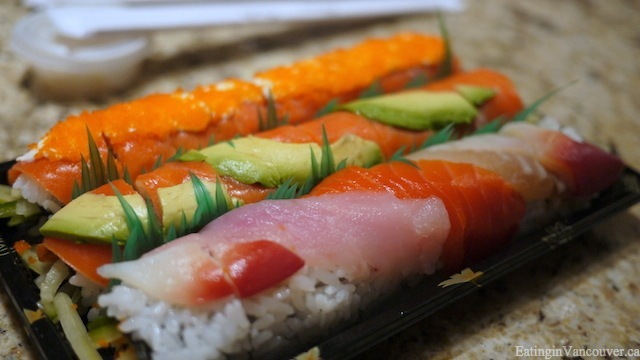 Have you been to Akemi Sushi? What was your experience? Let us know in the comments below.